Accessbet are a site you probably won’t have heard of, although they are – at least according to them – one of the fastest growing sports betting websites in Nigeria. While the site is certainly brimming with confidence, the lack of any kind of welcome bonus, at least any that’s clearly visible, is a disappointment. However, considering this site is virtually brand new, it emerged in 2018, we’re hoping that’s just an example of growing pains. But with so little out there about Accessbet in terms of customer or critical analysis, we’re very much going into this review without any frame of reference. Have we uncovered a hidden gem, or is there a good reason why so few people are talking about Accessbet? So, delve with us as we take a deeper look into the mystery that is Accessbet. If you want to explore the Accessbet site for yourself, click here. Well, it’s not just a welcome bonus that is missing from the Accessbet site. We can’t find anything regarding promotions at all. In fact, the only thing we could see that resembled a bonus – or at least a selling point – was a picture of a football and a ‘cash out’ logo. We thought perhaps it would be regarding early cash out options on in-play games, and perhaps that would take us to other similar features. However, what we got was a dead link to a blank page on the website. That’s not the only instance of parts of the site which simply do not work either. An FAQ link, which we hoped would answer some of our questions, was also broken. There is a reference to bonuses being offered to players on the sign-up sheet, with the ability to opt-in receiving notifications regarding offers and promotions. However, as we are unaware of the details of any of these promotions, we couldn’t possibly assess their quality. One area that Accessbet is clear is in its betting markets, which – for the most part – appear to be fairly decent. Here you can find several major sports, including soccer, tennis, ice hockey, MMA and so on, although there is a distinct lack of niche options. Everything here represents a fairly popular sport, meaning you’ll have to go elsewhere to bet on lesser-known events. Not only that but there is a big difference in terms of the content available per sport, with soccer and ice hockey having far more events to choose from than many other options combined. Nonetheless, it is a perfectly adequate selection for most people, although the lack of esports is notable. Moving onto the casino and what is clear is that the main focus here is on video slots, with things like video poker and table games only making up a small portion of the casino titles. Once again though, it’s virtual sports which surprises us with nine options in total. Overall, the selection here is flawed but better in some areas than we initially thought. In terms of mobile options, Accessbet is an unusual one because there’s no app available. However, there is a tab which essentially makes the site easier to use in mobile, but it works fine without it. Nonetheless, despite the unusual route you have to take for a more efficient site experience, once you’re on the ‘mobile site’, it does all work very well and is surprisingly easy to navigate. On top of that, everything appears to be here from both the casino and sports sections. 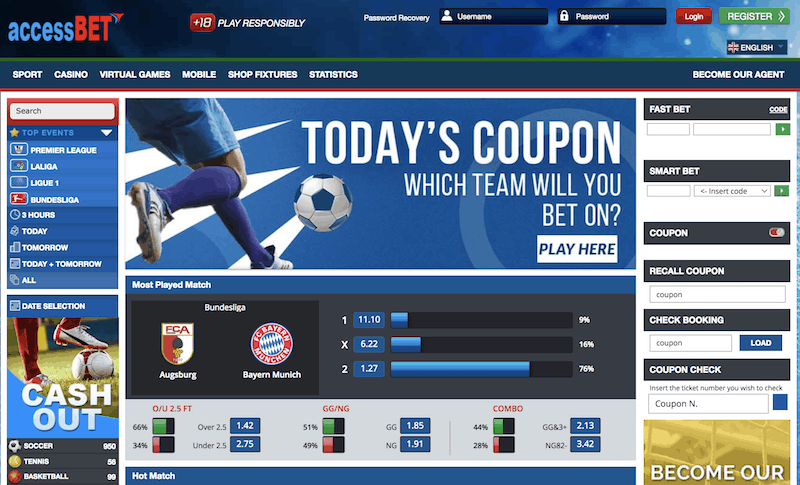 In terms of transferring the site experience over to the mobile one, we can’t really fault Accessbet here. It might not be the most flashy but it does work, and functionality is the most important thing when it comes to mobile sites. There’s no live streaming of real-life sports available on Accessbet. On the plus side, there are some virtual sports, and they aren’t half bad – although we did have the occasional issue with them loading. When they did though, they were fairly entertaining. In addition, there are also several options including horses, speedway and cycling, to name just a few. One of the clearest examples of how the lack of clarity on Accessbet harms the user experience comes in one of the most important areas: its banking options. There is information regarding transactions but it is vague in many places and, worse still, completely missing a lot of important details. Important information we were able to find on the site is that payment can be made through credit card, bank transfer, check and wire transfer. However, we cannot give any more detailed information on their banking practices, quite simply because either the information is not there or we were unable to understand it. 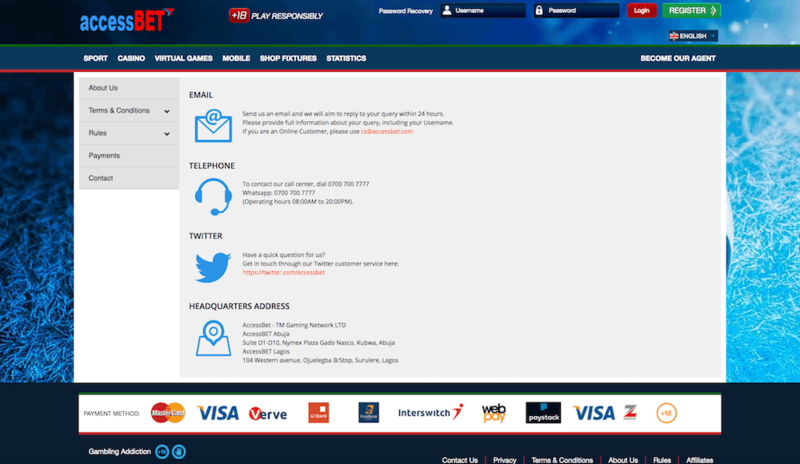 Accessbet has a few customer support options available, these include e-mail, call centre and twitter. However, the most important option they could have, live chat, is missing. Nonetheless, this is fairly standard for a Nigerian bookmaker and considering they are so new, we’d say that what is presented here isn’t too bad overall. Once again it’s a lack of customer feedback that leaves us in the dark here, although you could certainly make the argument that no news is likely good news, as people are generally quick to comment if they have bad customer service experience. We can’t get a fair impression of customer satisfaction in this regard, but it’s also fair to say we have no reason to think it is bad either. Most importantly, Accessbet state on their About Us page that they are regulated by the National Lottery Regulatory Commission, under the company name TM Gaming Networks. However, this is about as specific as they get. If there’s one area in which the lack of clarity is an issue, it is this. While some information can be found, you really need to go searching for it, and that’s never ideal. Accessbet does claim on their About Us page that they are backed by “strong Gaming Solution Providers” but don’t elaborate on exactly what that means. Furthermore, we couldn’t find any concrete information regarding encryption. We want to stress that we have no reason to believe, as far as we can gather from our research, that Accessbet is lacking in this department. But all that information needs to be clearly and prominently displayed in order to help put customers minds at ease. Plenty of the issues we have found with Accessbet are things that we hope are down to a new betting site finding its feet. However, when a site is lacking in important information it cannot be completely ignored, we just hope it is addressed promptly. 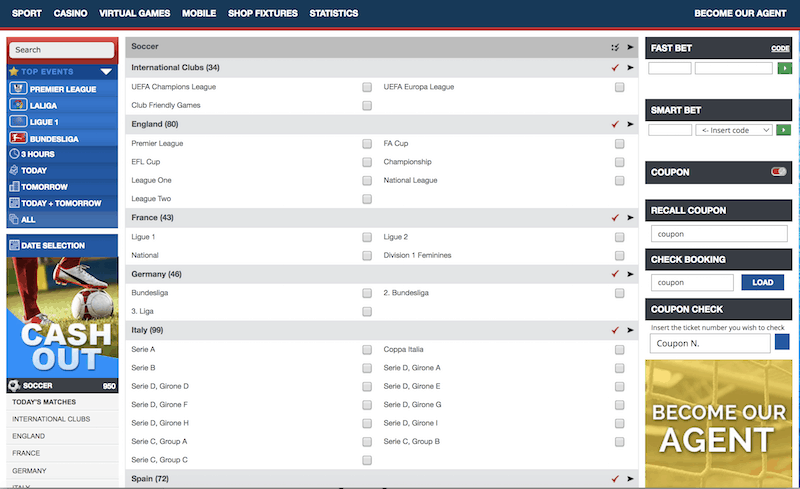 On the plus side this is a site with a decent amount of sports and betting options, and a surprisingly good mobile experience. 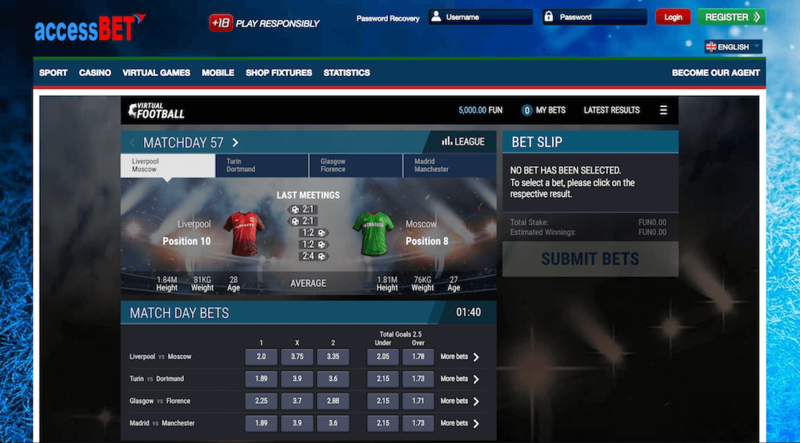 There’s potential in Accessbet, and with some ironing out of wrinkles, as well as some clear promotional options, we think they could be a very good betting site. Right now though, they have some room for improvement. Want to explore Accessbet for yourself? Click here to visit the site now.